2017 was such a great year with so many memorable moments. Ben and I decided to make as many trips as possible. Sometimes this meant leaving on Friday right after work and flying back on Monday morning going almost straight to work. Although I am the kind of person that really needs 8 hours of sleep, the moments were absolutely worth it. 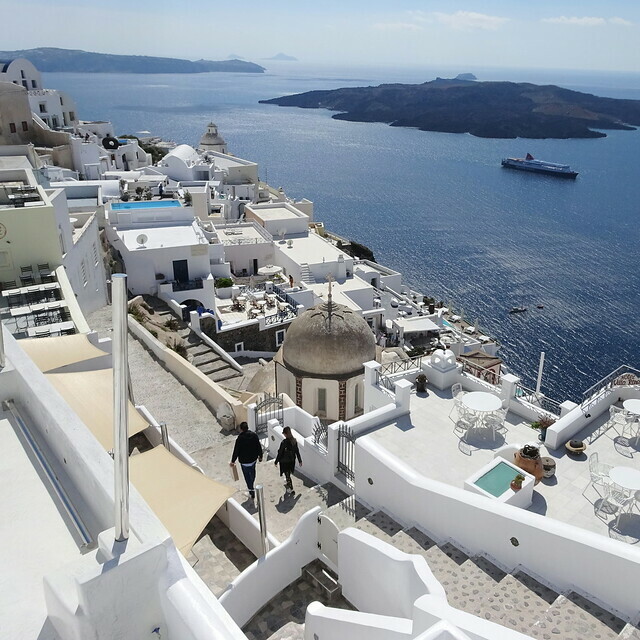 We had many plans like Greek island hopping, volcano trips, discovering the Dodecanese islands and the Saronic Islands, city trips and a trip to beautiful Santorini. We made it to do almost all of the plans we had. In this blog I want to share a list of the best memories of 2017. To create a top 10 was pretty difficult, as all memories are beautiful and unique in their own way. However, it might not be a real top 10 but, maybe they will inspire you when planning your trips for next year. Ben and I already started planning our trips for 2018 and if you have any tips, please feel welcome to share them! The reason why most people visit Athens, the mighty Acropolis. The ruin is, with its impressive Parthenon, dominating the city. This place is perfect to get inspired by the amazing history of the Greek Antiquity. After you got impressed by the entrance of the site, the Propylaia, the first thing you see is the enormous Parthenon. The view on the city is just stunning and I can imagine this place must be very powerful and impressive for its visitor at all times of history. 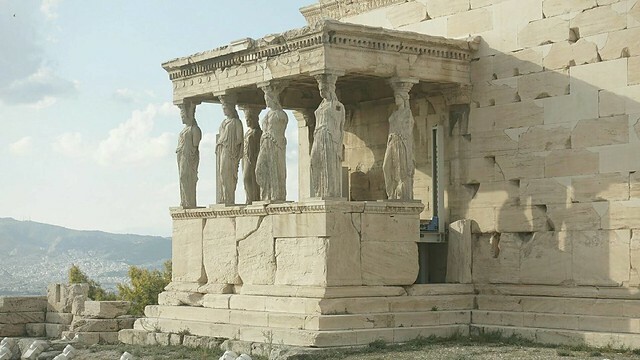 Planning a trip to Athens & the Acropolis? Check my previous blog for more info about this place and its history. It’s almost two years ago that I decided to move to Athens to discover this beautiful country. 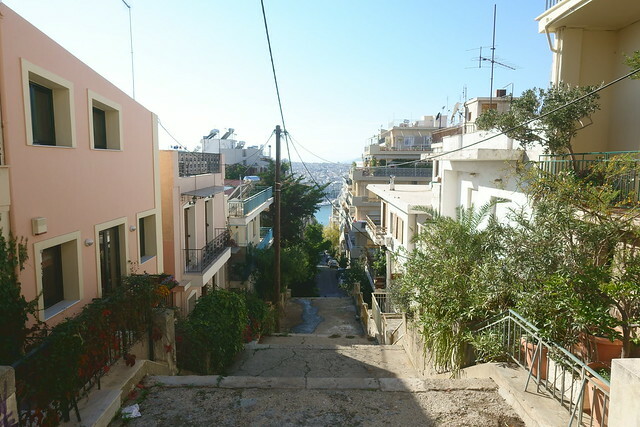 However, in January last year Ben and I decided to move to a complete different part of this city: Piraeus. The best thing about this decision is that I have got the opportunity to discover a totally different place with its own habits and lovely people. Piraeus is the where the main port of Athens is located since ancient times. This is where people come and go, it has a beautiful boulevard and interesting historical buildings. Just have a look on my previous blog to get an impression of this unique place. Santorini! Absolutely one of my favorite trips of 2017! Ben and I rented a car to discover the Island and made a boat trip to the Volcano. Jumping into the ocean for a swim to the hot spring was a bit of a challenge, as the water was only 17 degrees. However, the view on the caldera from Fira was such an impressive moment. Fira is one of the main cities on the island, you can see the blue domes all around you and stroll through the cute little streets with cute little shops everywhere. Santorini is a romantic place with its beautiful white houses and deep blue ocean. On every corner of this city is an amazing view. The unique, green nature, the blue ocean, the white buildings and the blue domes, I just fell in love with this place from de moment I saw it. And you thinks this place is a bit feminine… Ben just liked it as much as I did. My visit to Patmos was so peaceful. I you feel like you need to calm down and relax a bit, this is the place to be. Thanks to its history related to the holy cave and the monastery on the Island, you can feel a blissful atmosphere everywhere on the island. The Island is not touristic at all, most visitors are Greeks. 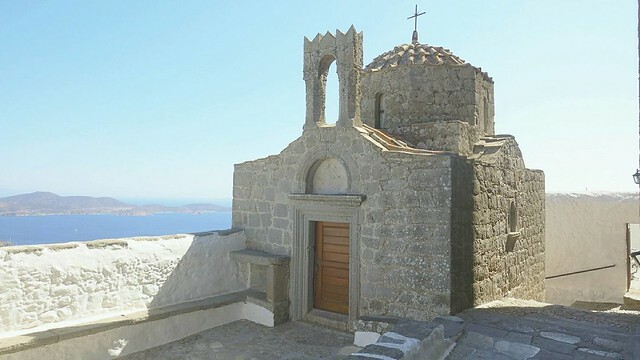 However, the inhabitants are very hospitable and they love to share the natural charms of Patmos with those who take the time to visit this beautiful place. The best thing to do to discover the beaches of the island, is to rent a car. Driving through the hills of Patmos is incredible and the beaches are the perfect place to calm down or enjoy a picnic. Patmos offers many different kind of beaches. Ben and I preferred the more quiet beaches. If you are interested I would suggest you to have a look on my previous blog. 6: The cutest Island in the world: Agistri! Agistri stole my heart. I took a ferry to this small island several times this year. The island is very close to Athens but still undiscovered. It is very quiet and covers an area 14.000 square metre. When I visit Agistri, I always rent a bike to cycle over the island. 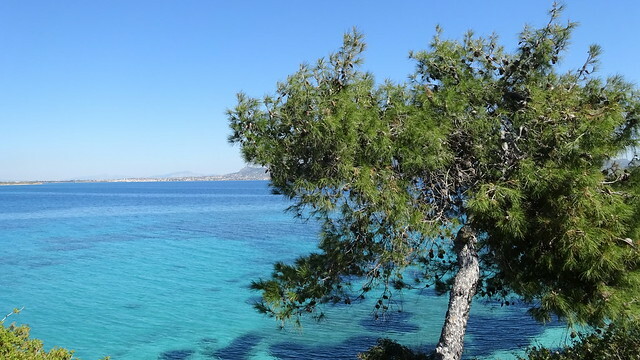 The first stop will be the beach of Dragonera, where the sea water is clear and you can admire the beautiful nature of the island. The rest of the tour might be a bit tough as it is a bit of a climb. However, surrounded by trees, the air feels very fresh, especially after being in Athens for a while. When you reach the other part of the island you may find another lovely beach and a salty lake. The nature here is a bit rough but very beautiful. 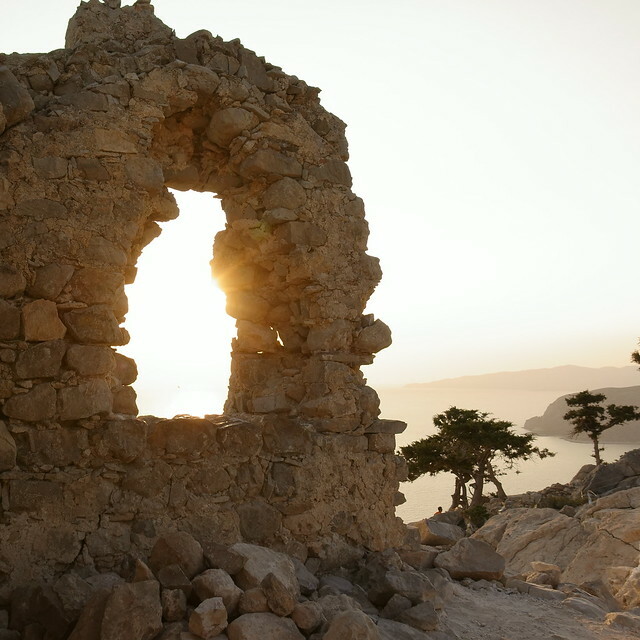 All sunsets are beautiful, but the old ruins on the Monolithos of Rhodes makes this moment of the day very special. After a long ride through the beautiful nature on the mountains of Rhodes you will arrive on this quit and impressive place. The old castle is built on a 100 m. rock and despite the fact that the castle is completely ruined, it offers a wonderful view. More about our trip to Rhodes can be found on my previous blog. I didn’t exactly know what to expect of Thessaloniki. However, the city didn’t disappoint me at all. Especially walking through the Old Town of this city was a lovely surprise for me. All the houses are very cute and colourful. They actually made me think of the houses I saw in the mountains of Switzerland. It is completely different from the other parts of the city. A bit higher than the old town you may find the ruins of the city’s Acropolis and the byzantine walls. From here Ben and I enjoyed the stunning view on the city. Also there are some pretty café’s with delicious traditional Greek sweets. While trying them you can enjoy the incredible view. I love Old towns. All of them are so cute and make my imagination grow. However, the Old town of Rhodes is one of a kind. I was enchanted by this place. The cute little streets with flowers everywhere around the castle of Rhodes Old Town made me feel like a princes. Every time I was walking through the streets of Rhodes old town I was wondering about the people who have lived here hundreds of years ago during the period the knights Hospitallers ruled the Island of Rhodes. I learned a lot about the history of the Knight Hospitallers, where I didn’t know much about. The caste is pretty impressive, but the archaeological museum, located in the old hospital, is one of the most beautiful and interesting museums I have seen so far. The courtyards are beautiful gardens decorated with beautiful mosaics and historical pieces. I can highly recommend to plan a visit to this unique Old Town, my previous blog might be helpful. Oooh, I loved walking to Chora and the beautiful monastery of Saint John. the main reason I wanted to visit Patmos was the cave of St. John, the place where the Book of Revelation was written. This was a very special moment that will forever have a special place in my heart. I could write pages about this visit, but there are no words to describe this experience. The cute white village beneath the impressive Monastery of Saint John, Chora is a very lovely and peaceful place. It is filled with flowers, small streets white houses and a small church on each corner. Since the village is located on one of Patmos hills you can enjoy an impressive view on the ocean and the nearby island. If you want to learn more about this peaceful place you may check my previous blog. I didn’t know how to put this list together, since I do not think there is a real number 10 or 5 or 3. 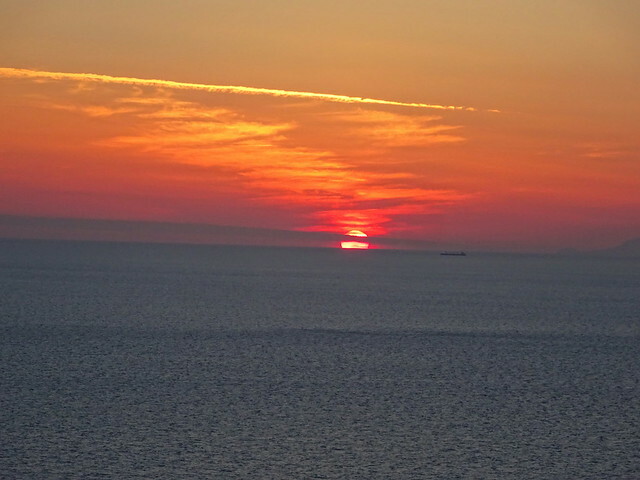 But I can say for sure the sunset of Oia in Santorini is may number 1. Everything about this moment was perfect. Of course because I shared it with my love Ben. But also the view on the unique white cave houses, the wind mills, delicious food and the unforgettable sunset made this moment my number one. I think this was our most expensive dinner of this year, but it was worth every single euro. If you have a bucket list, watching the Sunset in Oia should be on it for sure. So this was 2017, an amazing year! However, I am sure 2018 will be an great new experience, discovering a lot of new places. Ben and I already made some huge plans, however if you have any tips I would love to hear all about it! 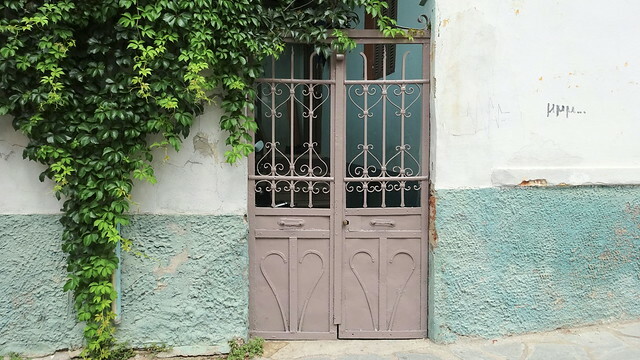 Volgend bericht Why you should definitely visit Thessaloniki!